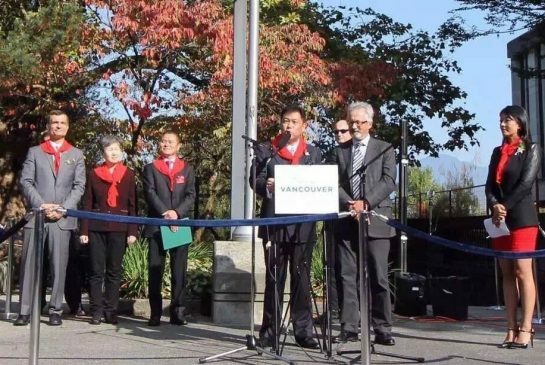 Representatives of Vancouver, Burnaby and the federal government took part in a flag-raising ceremony at Vancouver City Hall on Saturday to mark the 67th anniversary of the founding of the communist People's Republic of China. Last Saturday, October 1, the Chinese Communist flag was raised in front of Vancouver city hall to commemorate China's National Day. The event was organized by a group called the Canadian Alliance of Chinese Associations. The event was blessed by Vancouver councillor Kerry Jang and Richmond East MP Joe Peschisolido, who stood by with solemn, and at times smiley faces, while dutifully wearing Communist red scarves. Kerry Jang in particular has come under criticism by some Chinese-Canadians who feel offended at his seeming approval for Communist China. "I was shocked," said Meena Wong, former mayoral candidate for COPE. "To have my city councillor in my city hall raising the flag wearing the symbol of loyalty to communism, I was dumbfounded." An online petition, which we at CEC encourage readers to sign, calling for Jang's resignation, was started by the Alliance of the Guard of Canadian Values. You can be sure this event would have gone unnoticed were it not for the reaction of Chinese-Canadians. The very Canadians who should be complaining the most, the Eurocanadians who are being rapidly dispossessed of their country, don't realize the symbolic nature of this flag raising in pointing to the fact that a new people, the Chinese, are close to becoming the new rulers, in close association with the foreign policy objectives of China to see their race expand around the world. Vancouver is emblematic of the manner in which many formerly Anglo or European cities across Canada are being taken over by masses of Asians, Muslims, and Africans. The area of Richmond, which used to be identified as a section of Vancouver, but which is now a city onto itself, with myriads of newly arrived immigrants, has become a veritable Chinese-occupied city. 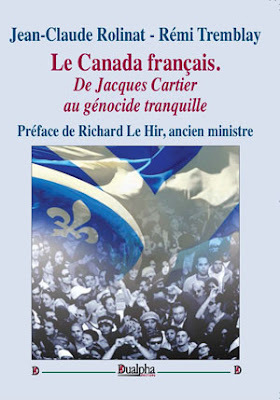 It is understandable that Eurocanadians are hesitant to fight against the colonization of Canada by non-Europeans considering that they are dominated by an ideology that not only brainwashes them into believing that it is good for them to be offering their lands, real estate, and jobs to foreigners, but which also threatens them with job losses and ostracism if they dare to question this transformation. Kerry Jang, possibly the most opportunistic politician in Canada, knows this, which is why he was quick to say that objections to the raising of the flag are "rooted in ignorance and racism...they're just anti-Chinese." Jang has made a career out of using these labels at the same time that he celebrates a Chinese government which practices racial eugenics, dispossesses Tibetans and the Uighur people of their lands, and violates the human rights of millions. It is high time that Eurocanadians stop taking these labels seriously, particularly when they are cynically employed by an opportunist whose loyalty to Canada hinges on the acceptance by Canadians of the ideology that they are racist if they don't celebrate Chinese migrants taking over city after city across Canada. The Chinese government is strategically employing Chinese migrants to gain power over multiple towns, cities, provinces, and lands with rich resources across the West, in New Zealand, Australia, and Canada — not to forget numerous cities across the United States. China has a massive population, the Han people, which have been literally spilling over the world, a demographic force which the government has used throughout history as an imperial weapon. This is how imperial China was created, through the export of millions of Chinese farmers, gradually moving into other people's lands, until they became the majority, at which point the Chinese state would impose Chinese rule and raise its flag. amalgamation of 45 BC-based Chinese organizations with a shared mission, which is to strengthen cooperation between China and Canada in economic development, trade, education, scientific research and technological development. It is indeed a group packed with "immigration lawyers, immigration consultants, immigration agents, and student visa services." But is more than the Chinese state gaining influence; it is the ever growing power of Asian groups in Canada pursuing their ethnic collective interests, and the reality that Canada is fast losing its founding Anglo/European character and acquiring a heavily Asian character. We Eurocanadians need to be very wary of what is going on; it is happening before our eyes, the colonization of Canada by masses of immigrants, and in the case of the Chinese, colonization with the conscious backing of the Chinese state, which is only too happy to raise its flag.